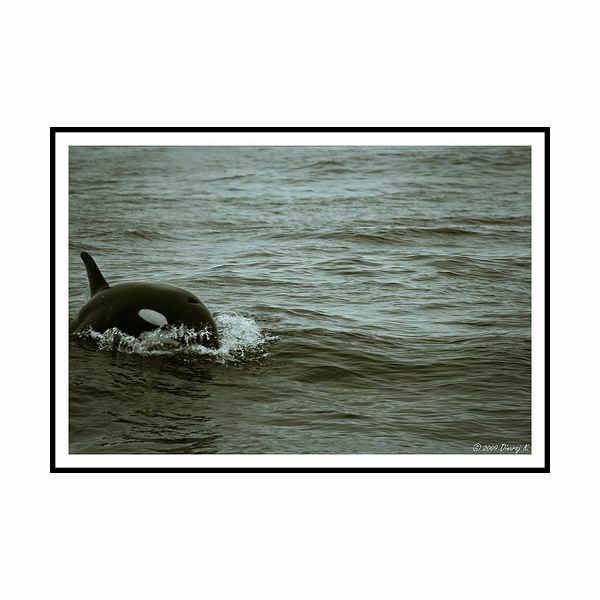 Killer whales are beautiful mammals with a very distinct black and white color pattern. A killer whale is enormous in size, reaching up to 32 feet in length and weighing more than 16,500 pounds. These whales have a long life span of up to 50 to 60 years. The endangered killer whales are different from most whales because they are killers. They consume a diet of harbor seals, sea lions, baleen whales, and other mammals of that size. They attack and kill larger food, which is unique from most whales. Unlike other whales, the killer whale lives in a community (pod) of other killer whales in numbers of 40-50, although the average size of a pod is only about 15. Killer whales are very social, which is one reason they live in large numbers. These whales often find the coastal waters of higher altitudes home, but can travel to all areas of the world. They tend to stray from tropical waters. Although these whales call all the oceans of the world home, they are most often found in the North Pacific, Arctic, and Antarctica. Why are Killer Whales Endangered? Many people often wonder why are killer whales endangered if they are so unique? Sadly, there are many threats to the endangered killer whales that drastically decrease their population numbers. Many contaminants in the oceans kill the whales, causing their numbers to diminish. The contaminants often include oil spills. Many of the killer whales are struck by vessels or entangled in fishing gear. The killer whales are often victims of whaling vessels and illegal whale hunting. The attempts for the conservation of endangered species includes the killer whales. Numerous conservation attempts are underway to try and save the killer whale population. The whales are protected by both the MMPA and ESA. Both agencies have made numerous projects possible to replenish the killer whale population. A large project to save the whales involves making whaling inside of U.S. waters illegal. Although it still occurs outside of U.S. waters, the amount of whales killed is believed to be lowered because of this effort. To eliminate the number of whales killed by vessel strikes and fishing gear, many ships and boats contain equipment to monitor where the whales are at. Many agencies frequently monitor the whales to keep track of them and record their population numbers. Other conservation of endangered species of killer whales includes projects to keep the whales food supply adequate. Salmon hatcheries are used to increase the number of fish for the whales to eat. With these efforts in place, the endangered killer whale may someday be removed from the endangered species list and no longer be threatened by extinction.